This site is dedicated to blending running and endurance sport with acrobatics/circus arts and living a vegan lifestyle. The benefits to this approach are huge, but above all, it’s a lot of fun. Disclaimer – I am not a medical doctor, personal trainer, physical therapist, nutritionist, or dietitian. The views expressed here are my own, and not to be taken as medical advice. See a licensed health professional if you have any concerns or medical questions. Sounds amazing….. to juggle and to jog at the same time? Have never ever seen this before! Danke, it means a lot coming from an inspirational person like you. There are many other people who juggle while they run. Its really fun and good for the mind, I’m sure you could do it. It just requires a lot of practice, and the belief that you can do it. Keep doing what you’re doing, you have a terrific blog. I really liked your post, and you’re welcome. Thanks for visiting my blog. I’m sure you could joggle too, just requires practice. Take care. I wish I had your hand to eye co-ordination! I wasn’t born with it, it took a lot of practice and patience. You can achieve it too. Thanks for stopping by! Hi, Wild Juggler! Nice skill you have. I too am a proponent of physical and mental health because I believe they compliment each other. Thanks for liking my post this week. Cheers and happy to you! Thanks for coming by! You have a super-cool blog! Love this! I don’t juggle often enough, but when it warms up I will have to break out the juggling clubs and do some garden juggling! That sounds fantastic. It’s always more exhilarating juggling or joggling in beautiful surroundings. I still only juggle with balls. I may work on clubs eventually, I hear they are a little more challenging. Joggling. Love it! Thanks for the like! I have always admired jugglers! But running and juggling at the same time? WOW! Way to go! Thank you for your comments and for stopping by my blog. Joggling isn’t as hard as it looks. You have some amazing photos! Thanks for visiting. No, that wasn’t me, since I haven’t been in any marathons and haven’t been doing this long enough to have inspired anyone to do that(to my knowledge). Maybe I have a twin? Thanks for joggling on by to my blog and liking my post. I can’t say the that kathi rolls are particularly healthy…… but tye’re yummy! Thanks for the visit and like, it’s good to know people are interested in what I write. Thanks for dropping by my blog and liking it:) I was just reading your blog on HIIE and wondered if you’d read Dr. Joe Mercola’s blog on the same topic? You do have an interesting blog, that’s for sure. As for Dr Mercola, I haven’t read his post on HIIE. I hardly ever visit his site these days. Thank you for following my blog. 😀 I’m definitely going to read yours – so much new information on jogging and juggling! I’ve never heard of doing both – amazing. As a relatively new jogger, I’m always happy to find new, inspiring things to keep me going – your blog has made it clear again that I can do it. Thank you. Thank you for your comments and for adding. Your blog rocks. Joggling isn’t as difficult as it looks, it just requires practice. I’ll be adding new tips every now and then so stay tuned. Thank you for your comments, Ricecakeann. Your blog rocks, you combine many interesting subjects. As far as joggling goes, it just takes practice, it isn’t as difficult as it looks. You can do it too. i used to be a passionate runner, i lost the steam now pliz help revive it. @ ricecakeann …Hello, i used to be a passionate runner, i lost the steam now pliz help revive it. Interesting blog with the juggling. Well thank you for coming by. It is always more interesting with you around. Take care! Thank you for liking my post and for bringing joggling into our collective consciousness. I love to watch the juggling act, but find it enough challenge to cast a fly correctly or to hike and chew on a pine twig at the same time. Keep up the interesting work. Thanks! It’s great to hear you just started running. As for hitting people – I’ve done it a few times, but only with soft balls and I only hit their foot or lower leg, nothing higher and they didn’t seem to care. This was a long time ago when I was just getting started. I think you could do it. You’re right that practice makes perfect. Thank you for coming by, Celeste. I appreciate your comments. I laughed when I first heard the word “joggling” too, I didn’t come up with it. Just about anyone can do it with enough practice. When I saw that you were a psychotherapist, I was thinking “oh no!” at first, but you seem to be one of the good ones. I hope you are a frequent visitor, we could learn a lot from you. See you. How ironic! Good luck to you with your writing career. To say I see a lot of potential in you is an understatement. I love the way you write too. Best of health to you Celeste. If you ever get writer’s block, juggling or joggling may be the solution. It’s always great to meet a fellow juggler. I’m sure you could become a joggler easily, Celeste. I have no dog but I can understand the challenge. I get chased by them sometimes, they think the balls are for them! Take care! Thanks for checking out my blog! Im definitely into fitness and healthy living and although not a juggler am a distance runner and can appreciate your passion. I am also NOT an official Vegan…. but 90% of my diet is!! Hence we have enough in common for me to be intrigued !! I will make sure to follow you and see whats new and exciting on your agenda! Cheers from Barcelona! Thank you for your comments and for coming by. I knew there was something about you, I’m not surprised that you’re a near vegan. You must be extremely healthy, especially with all the running you do. 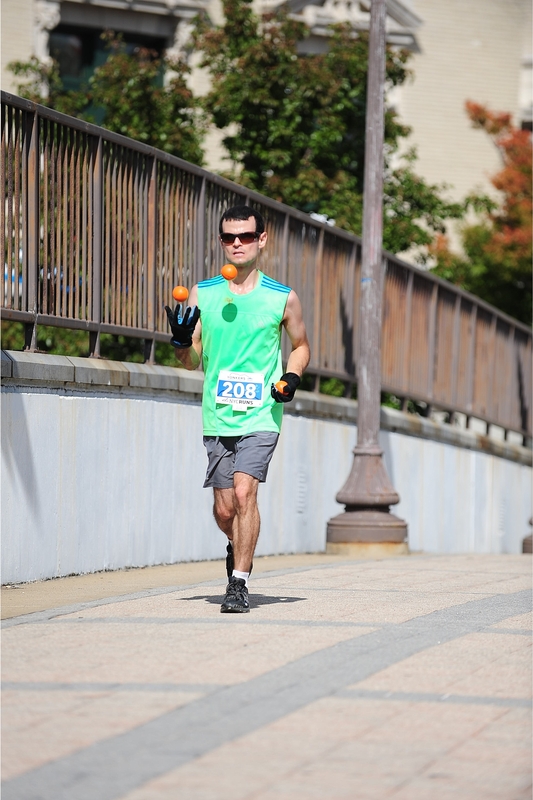 I’m actually more of a joggler(juggling while running) than juggler, I can barely juggle 4 balls. I sometimes debate myself if I should call my site “Wild Joggling” instead of “Wild Juggling”. Keep doing what you’re doing. Your site is inspiring and informative, you realize that health and beauty are 2 sides of the same coin and take this important concept to a whole new level. I will drop by whenever I can. Your words mean a lot to me. I’m always up to something new or crazy. Best of health to you! Thank you so much for stopping by! Until now, I have never heard of joggling, and I gotta tell you, reading about you I feel your positive vibe and endless energy. Cheers! Thank you for your comments, much appreciated. I feel much the same way about you, with everything you do I can feel that energy! I wish you the best. I love the word Joggling! I think you are on to something big! Thanks, though I didn’t invent the term or joggling itself. There are many other, much more experienced jogglers out there, I’m just one of them. Thank you for coming by, I love your hiking and nature photos! Thanks for following my blog. I love your space here. Joggling seems to be a fabulous activity!! Thank you for coming by Baldeep. Joggling can be an extraordinarily fun activity, I highly recommend it. Keep doing what you’re doing, you have a very educational site. Thank you! It is small attempt to bring issues hidden under the carpet on the dining table for discussion. I really liked the brain development aspect of Joggling–synchronization between both the hemispheres. Also, try running in zig zag way, forming the figure 8–will bring about the same effects! That is one of the many things I love about joggling. There are so many reasons this is a better way to run, at least for me. Thanks for stopping by. I have a question! Who takes these great photos of you joggling? Most of them were taken by the paparazzi who follow me everywhere. Actually, most are taken by me, or a friend, or my brother, or sometimes by this big scary creature in the wilderness who calls himself “Bigfoot”. I am actually not naturally well-coordinated. As a child I didn’t excel at sports. When I played baseball and soccer(both very briefly), I was usually the worst player on the team. What you see is mostly due to training, not some innate gift, which is why I think you could do it too. As far as sleeping goes, I don’t think juggling or joggling could help you sleep. All exercise can help you sleep if you do it early enough in the day and it is vigorous enough, and this can include juggling, but there is nothing special about juggling in this regard. Since juggling/joggling requires focus and is kind of like an active meditation, it may help you focus better. I think it has helped improve my focus, though it hasn’t made me “smarter” per se. I don’t know about using it to treat ADD though, I am not an expert on such things. Learning to juggle can cause the brain to grow in some areas, according to research, and maybe this can help you stay sharp. Thing is, this may be true of most exercise or playing a musical instrument. One thing is for sure – Joggling is a lot more tiring than running, especially when you start out. I hope you’re doing well, and if you do try it out, let me know how it goes. Are you a singer by any chance? Thank you so much for visiting my blog!! Wish u the best of luck in everything you do! Tks for sharing such a great and original blog! You’re welcome, Alexandra! And thank you for visiting mine. You’re always up to something intriguing. I’m always thinking “what will she do next?” when it comes to your blog. And the photos are so inspiring, they really draw me in. I wish you the best with everything you are doing, Alexandra. Thanks for sharing your sparkle. Thank you. It’s not that unique, it’s just uncommon. And a lot of fun! Your blog is pretty interesting too. Thank you for coming by. I think you can take this guy! I wish. I’d have to be 51 minutes faster at the marathon to beat his record. I saw you twice yesterday at the marathon. I was bib #13. First you passed me going up the huge hill. Then later after things had gotten rough for pretty much for all of us runners doing the full, I passed limping along at a slow jog and you were pushing on at a walk. I can’t tell you how many times I considered dropping out of that race. It wasn’t what I expected at all but kept on. I was expecting to PR but after mile 13 it just became about not collapsing. I am also Vegan and I think what you do is awesome! To keep juggling and endure that course must have required discipline on an incredible level. It’s admirable. Will you also be doing Brooklyn this year as well? Wish you a speedy recovery. Hi Lisa. Nice of you to come by and share your experiences. I remember you. Just looked up your time, very impressive considering those hills. What a brutal marathon that was! This was my worst marathon experience by far though also a very valuable experience. I injured myself on that final big hill around mile 23 and had to walk for a while after. This is my first time completing a marathon in over 4 hours(4:10). Last year I completed Yonkers in 3:40. It was much hillier this year obviously. From an athletic point of view this race was a disappointment, but from an entertainment/vegan promotional angle it was a success. I’m glad my joggling helps inspire vegans and non-vegans alike; it’s great when it opens people’s minds to veganism. There’s many vegan stereotypes we still have to fight. I could barely walk this morning but now I’m feeling much better. I won’t be joggling Brooklyn this year, I can’t stand running around in loops. Will you be doing it? If so, good luck! I did it a few years ago and did ok. I will blog about the Yonkers marathon in a few days. Wishing you a fast recovery too! It’s always great connecting with vegan athletes, especially after sharing the same crazy experience of nearly collapsing while climbing some hills in Yonkers. Take care! Thank you for stopping by Trudi! Always appreciate hearing from vegans from around the world. I’m glad some people find my site useful. Great to see veganism taking off in Europe. Take care!